Not far from Bend on the beautiful Deschutes River is a spectacular stretch of cascading whitewater rapids known as Benham Falls. Spend a day fly fishing for steelhead in the Deschutes River. Cascading Class VI rapids provide breathtaking scenery at Benham Falls. Enjoy a scenic hike or mountain bike ride on the trails nearby. Located in the Newberry National Volcanic Monument, just a few miles from Bend. Flowing through the spectacular scenery of central Oregon is the mighty Deschutes River, known for its excellent whitewater rapids. Benham Falls, located several miles south of Bend in the Newberry National Volcanic Monument, are the river’s largest falls. The picturesque cascading waters of Benham Falls are ranked as Class VI rapids. They were formed nearly 6,000 years ago when nearby Lava Butte erupted and dammed the river. Those who visit the falls can enjoy picnicking, hiking, mountain biking, and fishing amidst the towering Ponderosa pines indigenous to this area. To get to Benham Falls from Bend, travel about 15 miles south on Highway 97. Turn west on F.S. Road 9702 and travel another 4 miles. Contact information: Deschutes National Forest, 1001 SW Emkay Drive, Bend, OR 97702. Phone: 541-383-5300 or 541-593-2421 for the Lava Lands Visitors Center nearby. Visit the website here. Mountain Biking – Avid bikers can ride the scenic 4.8 mile trail from Benham Falls to Dillon Falls. 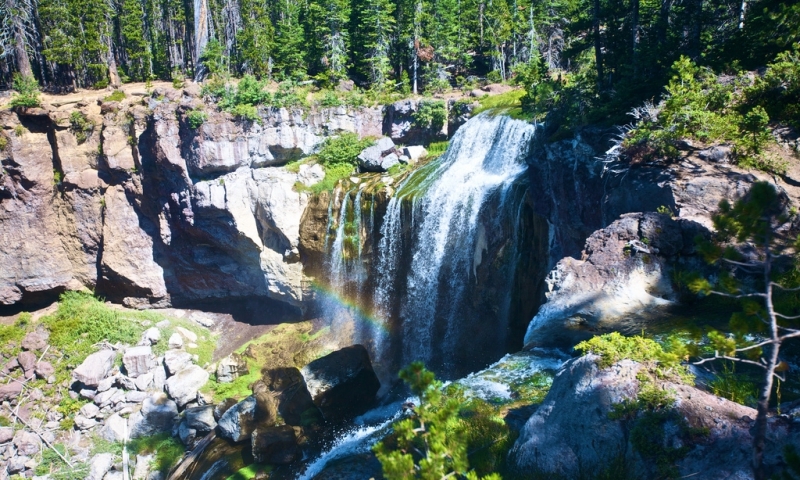 Hiking – Enjoy the beauty of central Oregon while hiking on trails near the falls. Pack a lunch and enjoy a picnic along the way. Fishing – Fly fishing for steelhead is a popular activity in this area. The elevation of Benham Falls is 4,150 feet. The Deschutes River has Wild and Scenic River designation. Benham Falls are the largest falls on the Deschutes River. They are ranked as Class VI whitewater rapids. The falls are named after a settler named J.R. Benham, who attempted to file a land claim nearby in 1885.